The Secretaría de la Defensa Nacional was one of the first departments formed when Mexico achieved independence in 1821 under the name of Ministerio de Guerra y Marina. In times of the Republic its name was changed to Secretaría de Guerra y Marina, to became as in present just until 1937. The current flag of the Secretaría de la Defensa Nacional is a white cloth charged with the President Fox's administration's emblem, populary known as the Águila Mocha. by Juan Manuel Gabino Villascán, October 2005. The official emblem of the Secretaría de la Defensa Nacional (SDN) used until December 2000, was based on the National Tricolor, where the Coat of Arms has been replaced by a golden ring charged with a green gold-outlined map of Mexico. Four golden five-pointed stars, aligned vertically over the green field, represent the high command, that is the Secretary of the National Defense; finally, the initials "SDN" in capital golden letters, aligned also vertically over the red field. During some events, specially the Army's day and Independence day, white cloths and guidons charged with this emblem were displayed. Juan Manuel Gabino Villascán, October 2005. The emblem of the Mexican Army is a horizontal triband green, white, red, behind a white silhouette of a soldier's head. At the building see of of the SEDENA, the National flag is flanked by two white flags bearing, one of them, the emblem of the Mexican Army (the other white cloth represents the Air Force). The flag, though unofficial, is proportioned 4:7. Juan Manuel Gabino Villascán, July 25, 2001. The emblem of the Mexican Air Force consists of a horizontal tri-band green, white, red, behind a white aircraft silhouette. At the building see of of the SEDENA, the National flag is flanked by two white flags bearing, one of them, the emblem of the Air Force. The flag, though unofficial, is proportioned 4:7.
by Ivan Sache and Juan Manuel Gabino Villascán, October 2005.
by Zachary Harden, December 2005. Located by Zach Harden, March 03, 2003. A square Mexican flag, is that seen often? by Zach Harden, March 03, 2003. 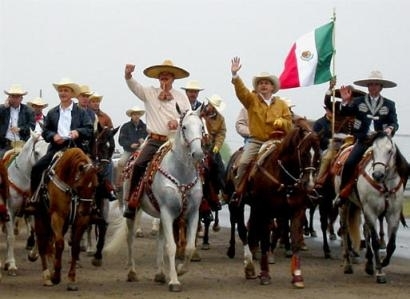 This flag is an example of a cavalry flag to be used in the Army and, of course, by Mexican President. The correct name in Spanish (of Mexico) is estandarte de caballería -cavalry standard-. Many of Mexico "Charros" organizations adopted the military cavalry standards to indentify themselves but with their corporative names in golden letters bellow the coat of arms and the text "Estados Unidos Mexicanos" in capital golden letters in semicircle above. Juan Manuel Gabino Villascán, March 05, 2003.